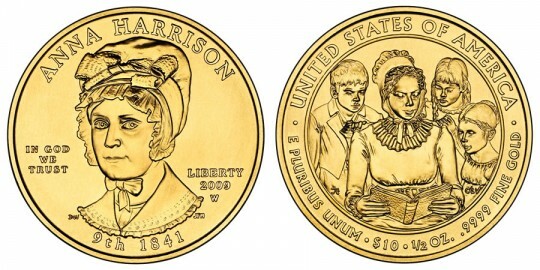 The Anna Harrison First Spouse Gold Coin in proof condition was released by the United States Mint on March 5, 2009. It is the 9th in a series (the first one for 2009) of gold coins meant as an tribute to the past first spouses of the United States. Born into wealth in New Jersey in the year 1775, she would actually spend most of her life in the frontier regions of the growing United States. She married a young William Henry Harrison in 1795 and together they would have 10 children. After assuming many political posts, William was elected the 9th President of the United States in 1840. Unable to be with him for his inauguration in Washington D.C. due to her poor health, she was in the process of joining him when she received news he had died of pneumonia a mere month after taking office. Also available is the Anna Harrison Coin uncirculated version. The World Mint Coins sister site of FirstSpouseCoins.us has additional information on the Anna Harrison Gold Coins. A portrait of Anna Harrison is depicted on the obverse side of the coin. It was designed by Donna Weaver and sculpted by Joseph Menna. Also inscribed are the words "ANNA HARRISON", "IN GOD WE TRUST", "LIBERTY", "2009", "9th 1841", and the mintmark "W". Designed by Thomas Cleveland and sculpted by Charles Vickers, the reverse portrays Anna and her love of teaching with her students. Included as well are the words "UNITED STATES OF AMERICA", "E PLURIBUS UNUM", "$10", "1/2 OZ. ", and ".9999 PURE GOLD".